I just want to make my mark, leave something musically good behind. If it's a big record, that's the frosting on the cake, but music's the main meal. 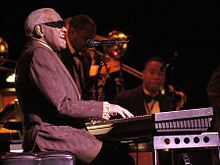 Ray Charles (September 23 1930 – June 10 2004), born Ray Charles Robinson, was an American Soul musician, singer, songwriter, and composer. Soul is when you take a song and make it a part of you — a part that's so true, so real, people think it must have happened to you. Pop Chronicles: Show 15 - The Soul Reformation I: A symposium on soul, interview recorded 1.2.1968. Variant: What is soul? It's like electricity — we don't really know what it is, but it's a force that can light a room. "A symposium on soul", Pop Chronicles, Show 15: The Soul Reformation, interview recorded 3.8.1968. Rhythm and blues used to be called race music. … This music was going on for years, but nobody paid any attention to it. Pop Chronicles: Show 55 - Crammer: A lively cram course on the history of rock and some other things, interview recorded 3.8.1968. I was born with music inside me. Music is nothing separate from me. It is me. 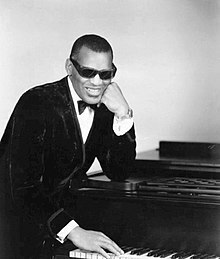 Though renditions by Ray Charles are among the most popular and famous, the lyrics of "Georgia On My Mind" (1930) were written by Stuart Gorrell and the music by Hoagy Carmichael. It's a little like a Ray Charles concert, isn't it? Georgia! Ian Darke, as quoted in "Englishman Ian Darke is voice of the Americans at World Cup" (10 June 2014), The Miami Herald.